Our goal is to foster each child's urge to grow. We emphasize the development of a positive self-image and the self-confidence to try new tasks. We believe that quality, educational group childcare is a positive and beneficial experience for children and families. Parents need to feel comfortable, informed and secure in the care and attention their children are receiving, and in the skills and values they are developing. Our program is designed to promote the safety and well being of children at their various stages of development. We value each child as an individual and work to provide an environment and experiences that encourage exploration, discovery and invention. 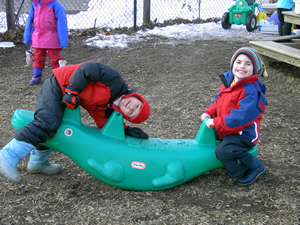 Children are learning about themselves and their world, whether snuggling in our laps, playing in the sandbox, listening to a story, cooking together, engaging in dramatic play, painting, building, running or climbing. We pay special attention to building self-esteem and encouraging social relationships. Children learn to express their feelings, assert themselves, negotiate and resolve conflicts. The Brookline Infant Toddler Center began in 1977 in a church basement in Brookline Village and was staffed initially by three teachers and a teacher/director who served fourteen infants and toddlers. The corporation formed at the time by parents and teachers functioned as a parent-staff cooperative, sharing administrative tasks and decisions. Over the years, BITC expanded to include a preschool room and moved to Chestnut Hill. After six years in Chestnut Hill, BITC moved again when the BROOKLINE Public Schools reclaimed our space. In June 1992 BITC reopened in our present home at 1900 Commonwealth Ave. in the Auburndale section of Newton. Also in June of 1992, the BITC community voted unanimously to dissolve the parent-teacher Board of Directors and to become an affiliate of James F. Farr, Inc. Farr, Inc. is a private, non-profit educational corporation which administers four programs: Farr Academy, which is an academic-therapeutic secondary school program serving behaviorally disordered, emotionally disturbed and learning disabled youngsters from Cambridge, Boston, and surrounding communities; Agape Inn, a respite care facility for multiply handicapped and ill children from infancy through 21 years; the Children's Center of Wakefield (CCW) and BITC, both developmentally based educational child care centers for children three months through kindergarten entry. In joining James F. Farr, Inc, BITC gained administrative and financial stability, while maintaining the high quality of our staff and program. BITC is convenient to Routes 30 and 128, and the Mass Pike, with public transportation convenient to Waltham, downtown Boston and the Natick- Framingham area.